Thirteen-year-old Blanca Garcia planted the American flag gently into the ground, just as 86-year-old war veteran, Bob Schmultzer, had done.The two, separated by generations, were demonstrating their patriotism, and their appreciation for those who have served, and currently serve, in the United States military. I think that's a great thing to show, that we can defend our country and how wonderful this country is," said Garcia, an eighth-grader at Bible Baptist Christian School in Hampton. Schmultzer, a member of Bible Baptist Church, is an Army veteran who served from 1941 to 1962. He is a survivor of the attack on Pearl Harbor, and a veteran of World War II and the Korean War.Schmultzer spearheaded the effort to install a semi-permanent display of some 90 American flags lining the driveway of the Bible Baptist Church and school.The flags are removable, Schmultzer said, and will be displayed during patriotic holidays like Veterans Day and Memorial Day. He said he hopes the tributes will re-ignite a sense of patriotism within the community, particularly in younger generations. "I hope patriotism will ring in their ear," Schmultzer said. 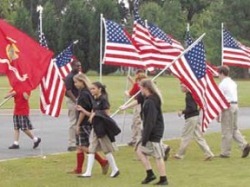 "For school children, we emphasize three things: patriotism, love of flag, and love of country. It appears that we're losing a little bit of that. "He and fellow church member, Bob Linton, also a World War II veteran, joined several other church members and students at the school Thursday to prepare the driveway for its inaugural flag tribute today, Patriot Day. The students helped plant the flags at the entrance of the church, where there stands five military flags mounted to 10-foot poles. 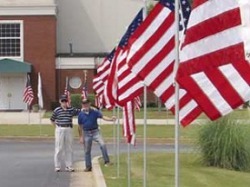 "It's an idea where church members could have a flag dedicated in honor of our troops," said Timothy Lee, principal at Bible Baptist Christian School. "The main focus of this is what brother Schmultzer is doing for our veterans." Schmultzer said the idea, which came to mind in July, and has grown since then. "I thought we'd have about 35 or 40 flags, at first," he added, "and all of a sudden, it started blooming. We have 90 flags now." Schmultzer comes from a family of servicemen and servicewomen. He said his five brothers and uncle served in the military, and that his wife, Luisa Schmultzer, served as a pharmacist in the U.S. Army from 1951 to 1955. They have a son, Paul Schmultzer, who is currently a major in the U.S. Army, according to Luisa Schmultzer. She said the family has purchased several of the American flags on display in honor of their many family members who have served in the military. "This is in remembrance of 9/11 that people are forgetting," said Luisa Schmultzer. "And they better remember that it happened. It could happen again. "We live in the greatest country in the world," she said. "Even now, as we speak, there are men and women that are giving their lives to keep the blessings that God has bestowed on this country."